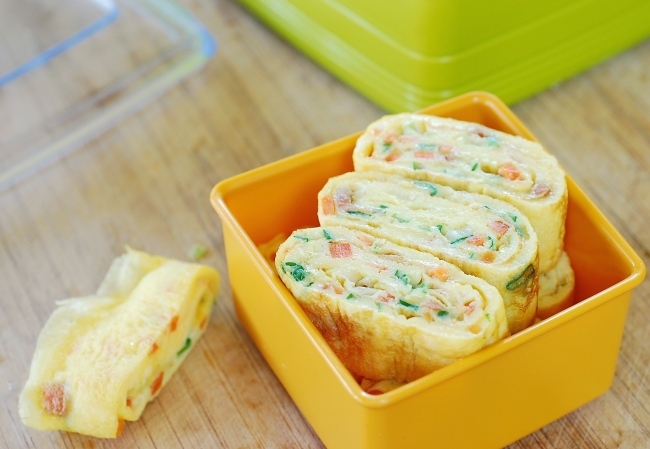 Gyeran mari is Korean-style rolled omelette typically made with one or two types of chopped vegetables. Here, it’s simply made with scallions and carrots. Gyeran mari is not hard to make once you have the basics down. Cook the eggs over gentle heat until set, then tightly roll or fold in layers, and cut into slices. That’s it! You’ll be rewarded with a delicious side dish that can be whipped up quickly. Gyeran mari is great as a lunch box item as well. Finely chop the scallion and carrot. Crack and beat the eggs, in a bowl with a spoon or a fork, until the yolks and whites are blended well with no visible strings of whites. Stir in a pinch of salt. Stir in the vegetables. Preheat a medium size nonstick pan over medium low heat. Add a teaspoon of vegetable oil, and distribute the oil evenly all over the pan, using a napkin or paper towel. Add 1/2 of the egg mixture to the pan. Swirl it around to cover the pan. Using a spatula, lift one end of the egg (about 4 centimeters) and fold it over to the other side. Reduce the heat or raise the pan away from the heat for a little while to avoid browning the egg. Lift the folded part and fold it again. Push the egg to the rolled side, making room on the round end for an additional egg. Add 1/2 of the remaining egg and spread to cover the open space. Lift the folded part and fold it again. Repeat the process with the remaining egg to make an about 5- to 6-centimeter thick egg log. Remove from the pan and let cool for about 5 minutes. Slice the egg into thick, even pieces.